At the intersection of global competence/citizenship and diversity, equity, inclusion. 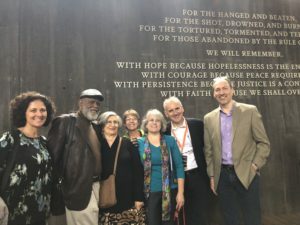 Events like the white supremacist rally one year ago in Charlottesville spurred my focus to greater intensity, and having the honor of attending the opening of the National Memorial for Peace and Justice (the Lynching Memorial) in Montgomery, AL last April added a shot of inspiration and urgency (a few photos included below). I consider it a great privilege to get to work with individual schools like Notre Dame Academy and associations like the National Education Foundation and ISACS, and get to present at NAIS POCC conference (pre-register for Eric Dozier and my popular Equity Seminar: Deeper than Diversity: Building a Culture of Equity) and the Association of American Schools in South America, as well as with corporate Diversity and Inclusion officers and staff, among others. 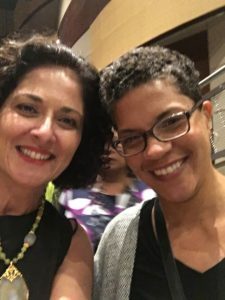 With this privilege comes the responsibility to connect equity and inclusion issues with global education – two big topics that usually remain siloed. With divisive voices growing louder, I consider it vital to help educators figure out how to address both of these areas, so students can grow their cultural, racial and global competence, at a time the world needs these so badly. Working with a fabulous team from Barefoot Books to write Global Kids Cards, in a similar vein as their popular Mindful Kids cards. These will be 50 activity cards highlighting 10 of each globally inspired play/games, food, celebrations, crafts, and helping ideas for young elementary and pre-K kids. The whole process has been pretty complicated – to make it culturally authentic, simple, unique, kid-friendly, using simple materials, few words is not easy! But it’s going to be gorgeous and fun, once it’s published next fall, the 10th Anniversary of Growing Up Global! There’s lots more going on, and if you’d like to explore cultural competence, diversity/equity/inclusion, or global citizenship/competence at your school or workplace, please be in touch! A few of the Bahai’s present for the prayer gathering before the Lynching Memorial official opening. Panorama view of one wall of the Lynching Memorial. Such a powerful space to behold and ponder. 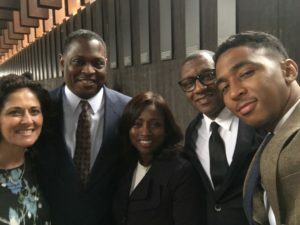 At the prayer gathering before official public opening of the Lynching Memorial, the Philly delegation: with Deborah and Reverend Greg Holston of Power Interfaith, and educator extraordinaire, Howard Stevenson and son, Bryan.